The predecessor model Evolution has been a great success for many treasure hunters that only used common metal detectors beforehand. 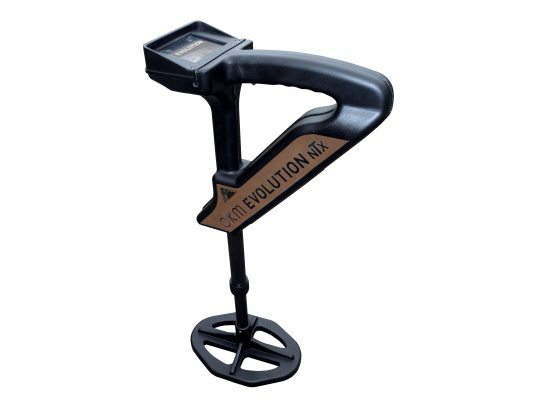 With OKM’s new introductory model OKM Evolution NTX you get a powerful 3d ground scanner and metal detector for an attractive price. Improved sensor and coil technology. OKM Evolution NTX The successor of OKM’s Evolution is more compact and comes with improved features like rechargeable internal batteries. OKM Evolution NTX with color touchscreen All functions and operating modes are selected via touchscreen. Intuitive menu navigation allows easy operation of the OKM Evolution NTX. The 3d ground scanner OKM Evolution NTX supports two operating modes to research the underground soils for hidden objects and structures. The length of the detector can be adjusted individually according to your own body height. Thus you can make this metal detector your metal detector. Conducting scans with OKM Evolution NTX The operator can choose between two operating modes: Live Scan and 3D Scan. Both modes can detect underground objects and hidden structures. OKM Evolution NTX with telescopic search coil The length of the metal detector OKM Evolution NTX can be adjusted to the personal body height of the operator. OKM Evolution NTX – Live Sound The operating mode Live Sound activates the integrated VLF metal detector to find shallow metal objects under the ground surface.